Some 40,000 people descended upon Omaha, Nebraska – a city with just 15,000 hotel rooms. They all showed up for the Berkshire Hathaway (NYSE: BRK-B) annual meeting . . . and a chance to be in the room with Chairman Warren Buffett and partner Charlie Munger. Warren Buffett says the stocks are not in a bubble and announced that Berkshire Hathaway has been loading up on Apple stock during the first three months of the year. 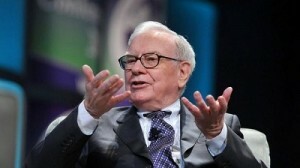 Two years ago, Buffett stepped up and bought shares of Apple (NASDAQ: AAPL). Despite Apple’s rising share price, he’s continued to add to the position. A recent 13F filing with the SEC shows that Berkshire owns 4.9% of Apple’s outstanding stock. That values the position at $44 billion, making it the No. 1 stock in the portfolio. Buffett told investors that he approves of Apple’s new $100 billion stock buyback, and that as a result, Berkshire may eventually own 6% – 7% of Apple stock. Since the 2017 annual meeting, cryptocurrencies including Bitcoin and Ethereum have gone mainstream. Therefore, it wasn’t surprising that folks at the meeting wanted to ask the world’s best investor for his thoughts. Meanwhile, business partner Charlie Munger was even more critical. He said, “I like cryptocurrencies a lot less than you do. To me, it’s just dementia. It’s like someone else is trading turds and you decide that you can’t be left out. Do you agree or disagree with Buffett and Munger? Click here to join the conversation in our Facebook Group. Berkshire reported first-quarter earnings that included a net loss of $1.14 billion. In his annual letter, Warren Buffett warned investors that new accounting rules could affect Berkshire. Specifically, new rules require the company to report net income including gains and losses on stock holdings. This requires unrealized gains and losses to be reported on the profit-and loss-statement. Previously, unrealized gains and losses were not reported. For the first quarter, Berkshire reported operating income of $5.29 billion. That was a 49% increase from last year – and excludes the impact of unrealized investment gains and losses. One of Berkshire’s big holdings is a company called Phillips 66 (NYSE: PSX). The company was a spinoff from ConocoPhillips in 2012 and is a major oil refiner. Berkshire’s current investment is worth $5.3 billion. That means that Berkshire owns 9.8% of the outstanding stock. With crude oil prices surging in the last year, Phillips could earn record profits. Go here right now to discover why a retired Fortune 500 CEO plans to launch a new energy IPO.